Joshua Robertson is an award-winning author in epic, dark fantasy. You may recognize him as the dude whose dragons were said to destroy George R.R. Martin's and Christopher Paolini's dragons in a very biased Twitter poll. His first novel, Melkorka, was released in 2015, and he has been writing fantasy fiction like clockwork ever since. Known most for his Thrice Nine Legends Saga, Robertson enjoys an ever-expanding and extremely loyal following of readers. He currently lives in North Carolina with his better half and his horde of goblins. Runa returns late one night to the home she shares with her brother and sister-in-law. Strange sounds greet her at the entrance: slurping, lip smacking, tearing. Nobody answers her call, but the dim light of the hearth reveals her brother gorging himself on the remains of his wife. Ranvir has gone mad. There is nothing in his gaze but hunger; he says nothing except the word ‘Stjarfi’. Only very few of the Thursar know this name, only they understand the madness gripping Ranvir and the evil it portents. The law says murder must be punished with death. Hunfirth and many other Thursar are eager to deliver this justice, but the leader of their clan insists on waiting for the wise elder, Wisaric, to return so he may provide counsel on this strange crime and its cause. Blood and Bile tells a compelling story of ancient magic and undying curses. The magic system is complex, but well defined. The giant-like Thursar have a rigidly patriarchal society. As offensive and outdated as this stereotypical cultural structure is, authors JC Boyd and Joshua Robertson successfully use this to frame the psychology of their characters and layer their conflicts and motives. Although Runa's and Hunfirth’s individual desires set them against each other early on, they both remain relatable. There’s merit in both characters' logic, and evil in both their actions, making it impossible to label either as villain or as hero. There are vivid depictions of cannibalism in Blood and Bile, but gore is to be expected in dark fantasy. A tense, character driven plot propels the tale down ever more winding roads until the shocking conclusion. Blood and Bile is the first book in the Legacy series by the author duo JC Boyd and Joshua Robertson. Runa loves her brother, Ranvir. She is happy living with him and her kin-sister Caitriona. She had never thought him capable of the deed she witnessed. Her eyes could barely process the image of Ranvir bent over his wife, his face and hands glistening with blood as he devoured her flesh. The word 'Stjarfi' played on his lips, and Runa was convinced he had been claimed by madness. Their people have a law, death is answered for with death and, madness or not, there is a call for justice, an insistence that Ranvir be made to answer for his actions. Runa begs for mercy for him, insisting that one with a clouded mind should not be condemned in the same way as one whose thoughts were clear at the time of the act. For the sake of her brother, there is nothing Runa will not do. Conflict is coming, a confrontation that will be answered with blood. Blood and Bile is certainly not your run of the mill dark fantasy. Progressing at a steady pace, you get drawn into a world of dark fantasy, cannibalism, beliefs, and politics. There's rarely a dull moment as you follow the characters' adventures and learn their motivations. There are those you will like, and others you will outright hate. As the plot focuses around one small community, you get a real sense of the way of life, and yet JC Boyd and Joshua Robertson also achieve some amazing world building. Blood and Bile is written with talent and skill. The characters are real, emotional, fallible, and develop and change throughout the course of the story, along with the rising tension of events. This was certainly an interesting first book, and shows much promise for the series. 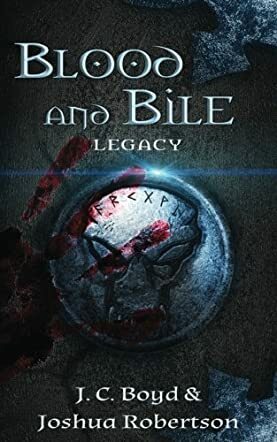 Blood and Bile by JC Boyd and Joshua Robertson is the first installment in the Legacy series, a dark fantasy featuring zombies and centered on a small Scandinavian community. The reader is introduced to a cast of compelling characters and the part they play in the community. It is difficult to pull out a protagonist — the community is the protagonist. Without going into the complex, labyrinthine plot, I’d like to share some of the things that fascinated me with the writing. First off, the setting is gorgeous, a reflection of a small community with its rules and way of life and extraordinary characters. The authors do a wonderful job of bringing out the cultural elements of the setting through the narrative. The images of places are strongly impressed on the minds of readers, thanks to the excellent descriptive prose. The writing is awesome, and it is punctuated by intelligently crafted dialogues and powerful descriptions. The story is told in the alternating voices of the characters — Runa and Hunfrith. The authors are masters at creating suspense and getting readers emotionally involved in the story as they follow the characters. I also enjoyed the cast of feminine characters and the role they play in the story. There is a kind of darkness about this novel that absorbs the reader, irritates them at times, but it is a darkness that is irresistible. Blood and Bile is beautifully written, intelligently plotted, and readers can’t help but allow themselves to be pulled into the world the authors have created.